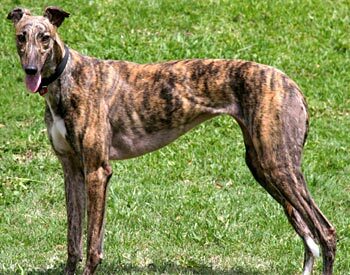 Danielle, aka Sp's Hot Dam, is a striking, dark brindle girl born on October 9, 2005. Her sire is Gable Oscar, making her grand sire the late famous Gable Dodge, and her dam is SP's Katie. 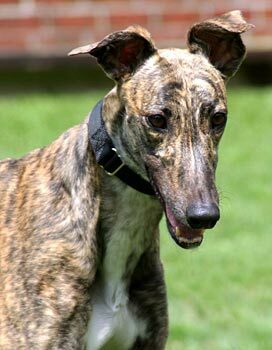 Danielle is one of the Greyhounds that needs placement with the closing of the track in Corpus Christi. She has no races to her name. Danielle is thrilled to be living in a home. She can be a bit bossy with the other dogs in the house, but is never nasty about it. 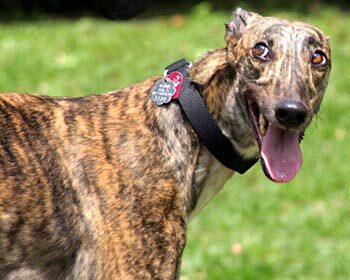 Danielle is house trained to the dog door in her foster home, but does not like to be crated. She will occasionally relax on the dog beds, but she prefers the higher perch of a sofa. She will make a lovely companion for some lucky person. Danielle's cat test: Danielle passed her cat test. She got to sniff the cat a couple of times with and without the muzzle. The last round, she preferred to back out of close quarters rather than turn and walk away. She seems to have a healthy respect for the cat but as is always the case, should be closely supervised when getting acquainted with new buddies of the feline persuasion. She will be introduced to small dogs at a later time.